The singer's new album is on the way. The Weeknd has posted the official artwork for his new album 'Starboy' on Instagram. The Canadian singer, known for his extravagant hairstyle, also appears to have cut his locks in favour of a shorter trim. There is currently no release date for The Weeknd's new project. However we will update this page as soon as more information becomes available. 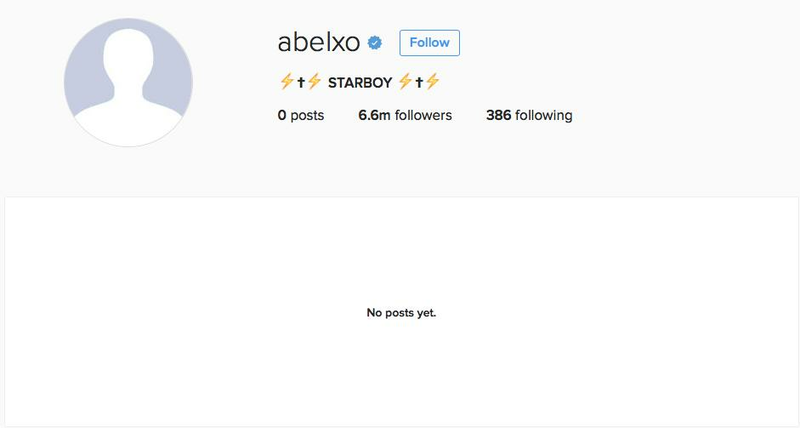 The Weeknd has deleted all of his posts on Instagram, amid rumours he is ready to drop his new album. His page, which has 6.6 million followers, is currently showing nothing. The ‘Can’t Feel My Face’ singer has also been dropping a number of cryptic clues over recent weeks on Twitter. The leaves emoji plus the hourglass emoji possibly suggest that something is coming this Autumn. In an interview with VMAN, he said: “Even though I've been putting out bodies of work for years, Beauty Behind the Madness felt like the beginning. "My purpose is to make exciting music and I feel like I'll be doing that for the rest of my life, so there's no pressure. "Nothing is stopping me from doing what I love to do." The Weeknd deletes everything off his Instagram to prepare for his new album. It's apparently due out next Friday! The Weeknd deleted all of his instagram posts. @dubscorleone It's happening. The Weeknd just wiped his Instagram profile. He always does before he releases an album lol. The Weeknd’s 2015 album ‘Beauty Behind The Madness’, featuring singles such as ‘The Hills’ and ‘Can’t Feel My Face’ charted at No. 1 in the UK.